This Barksdale Temperature Switch p/n T1X-H351S is a single setting, SPDT snap-action bulb and capillary (6') temperature Switch. This Temperature switch is Explosion-Proof and designed for Hazardous Areas, Class 1, Div. 1 & 2, Groups B, C, D; Class 2, groups E, F, G; Class 3. The Enclosure classifications are NEMA 4, 7, 9 and IP66 along with approvals UL and CSA.. The T1XH351S has an enclosed terminal strip and has a tamperproof external adjustment. Switch is rated 10 amps 120 or 240 VAC. 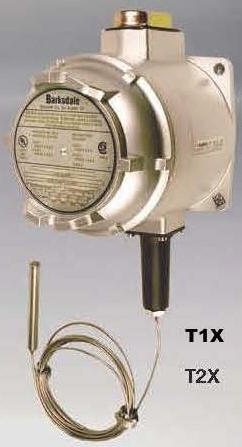 Barksdale T1X-H351S single setting EP temperature switch. Click here to return to the full list of Barksdale Explosion-Proof Temperature Switches.